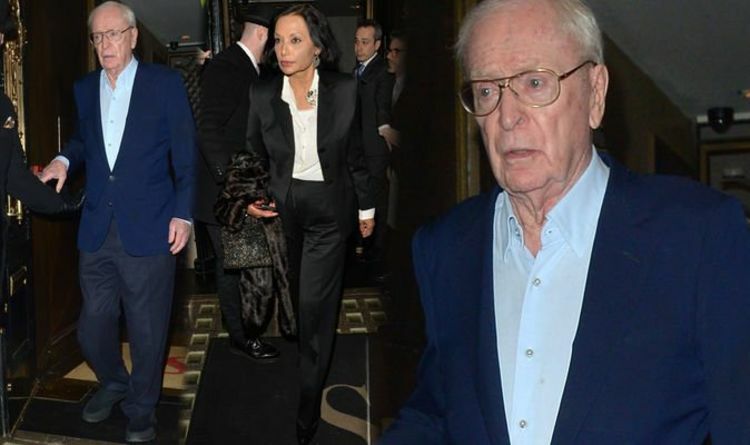 Sir Michael Caine enjoyed an evening out in London last night with his wife Shakira. The couple, who have been married for 46 years, were pictured leaving Scott’s seafood restaurant following a romantic meal at the Mayfair restaurant. Dressed smartly in a navy blue suit jacket and light blue shirt, the actor, who celebrated his 86th birthday last week, walked to a waiting taxi without the aid of a walking stick which he has been seen using of late. His elegant wife, 72, looked chic in a black suit worn with a white shirt embellished with silver beads at the collar. The loved-up pair climbed into the back of the taxi at the end of the night to be whisked home. Also at the famous eatery last night was American actor Samuel L Jackson, 70, who co-starred in Kingsman: The Secret Service with Michael back in 2014. It is not known if the duo will appear in the third episode of the spy movie franchise which is currently being filmed. The King of Thieves star, who has been making movies since the 1950s, shows no signs of slowing down and has three new films currently in post production. Due to be released in the very near future are films Medieval, Come Away and Four Kids and It. In upcoming Czech drama Medieval, Michael plays fictional character Lord Boreš alongside fellow Brit Matthew Goode and American actor Ben Foster who takes on the starring role of renowned military commander Jan Žižka. It looks like 2019 will be a busy year for the Oscar-winning actor.